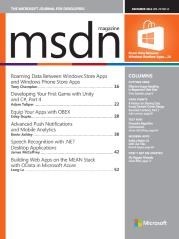 The December issue of MSDN magazine has my latest article on using roaming data in Universal apps. The article takes a look using the shared API to allow you to not only roam data between different instances of the same app, but across platforms between Windows Phone and Windows. The article can be found online at http://tonyc.me/MSDNRoaming or by picking up your own copy of the magazine.